Chabad of Owings Mills proudly serves our local community with love and care. So that we can continue to do so, we have created a short survey, please take the 3 minutes to fill it out. This survey will give us a better idea of how we can serve you best. We keep all replies confidential, and you have the option to remain anonymous. (If you want us to get back to you, please write your name and info). 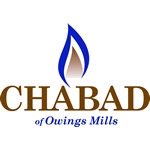 What do you most enjoy about Chabad Owings Mills? Do you have a child or grandchild away at college? Let Chabad Owings Mills introduce him/her to the local Chabad chapter, meet new friends, and renew Jewish values. Please share their information and we will do the rest. Chabad Owings Mills' Youth programs serves children ages 2-13. Are you interested in having youth programming offered to your child? Yes, I'd love that! Our child's is already part of a Jewish youth program - so not now. Our kids are not in that age group. Many people like to leave a gift to charity in their will. Would you consider leaving Chabad Owings Mills in yours? I have already included Chabad Owings Mills in my will. I would probably include Chabad in my will. I would like to speak to someone about including Chabad Owings Mills in my will. I am not interested at this time. What would you suggest we do to enhance the success of Chabad Owings Mills?